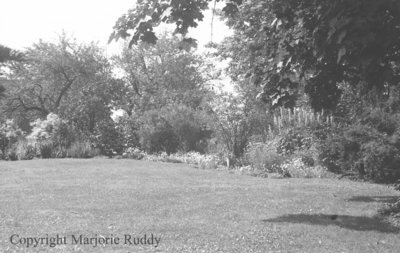 A black and white negative of a garden at 600 King Street in Whitby, Ontario. This house, at the southwest corner of King and St. John Streets, was built in 1914 for Dr. Horace Bascom, Registrar of the Ontario County Courts and later Sheriff. After Dr. Bascom's death in 1956 the house was owned by Duncan McIntyre. Gardens at 600 King Street, July 5, 1939, Marjorie Ruddy. Whitby Archives A2013_040_804D.